Music industry professional Rick Beato says that training is the biggest factor when it comes to critically evaluating music. Rick Beato, a music industry professional and a popular YouTuber, says in a recent video that file size and equipment choices don't matter. 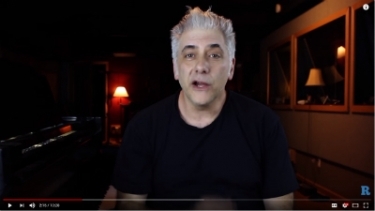 Is the popular online music teacher, songwriter and producer Rick Beato calling out the audiophile community in his latest YouTube post? Beato, a professional musician with a number one single to his songwriting credits, along with a Masters degree from the prestigious music school New England Conservatory (NEC), and thousands of social media followers, says listeners can't distinguish between audio files once they reach a certain level of quality. Beato states in his YouTube video that, "It's very unlikely that he nor anyone else can tell the difference between a 320kbps file and a 44kHz WAV file," and that they may "simply be guessing." Beato explains that he was responding to a fan asking for his record in a 24-bit/44kHz version. Beato says that he told the fan that once a listener gets to the level where they are listening to 320kbps files and above, they are guessing at the quality level of the file because even trained professionals can't tell the difference. "And I said that if someone tells them they can then don't believe them." "It's very unlikely that he nor anyone else can tell the difference between a 320kbps file and a 44kHz WAV file,"
Beato's claim, of course, flies in the face of decades of activity in the consumer audio market, which up until recently staked its reputation on being the arbiters of good sound. Moreover, his post supports the evolution of the music industry, which has transitioned from physical media, to downloads, and now to streaming media. This evolution is being driven by Millennials and other "lifestyle consumers," which has resulted in most of the music consumption being done with content that is less than CD-level quality through a range of streaming services. After providing some background on compressed audio files, Beato says in order to test his theory, he asked his assistant to take an audio test put together by NPR called "How Well Can you Hear Audio Quality?" His assistant Michelle is not a typical Millennial or consumer who just simply likes music. Michelle has a degree in music production from Berklee School of Music; she has hearing up to 18.1kHz, and she has perfect pitch, which means she can hear a musical note and identify it without a reference tone. Once Michelle completed the test, Beato points out that someone with good hearing, perfect pitch and audio production training could only score 66 percent. Beato continues by stressing that as people age they tend to lose the ability to hear higher frequencies. "You also might not be able to tell the difference between an MP3 and WAV file. It doesn't matter ... it doesn't mean that your ability to balance a mix has anything to do with that." He also points out that most of the professionals in the audio production world range in age from their mid 40s to their 60s, and regardless of the monitors they are using, they are able to mix audio because of their training and the many years of experience they have in the field despite any hearing limitations. "Your ability to be an audiophile is actually dependent on the ability to hear things that really don't depend on your ability to hear frequencies that are really high or things like that," he comments. "You also might not be able to tell the difference between an MP3 and WAV file. It doesn't matter ... it doesn't mean that your ability to balance a mix has anything to do with that. There's a lot of experience involved with this in how frequencies work together, and they have different strategies they use that go beyond just your ability to hear." He adds that if he were to go out and buy an audiophile pair of speakers they probably wouldn't play audio the way the artists and production people intended the content to sound. Beato concludes his premise saying that so much of what someone hears is what they've been trained to hear. The audio quality of things, whether its 128kbps MP3, 44k, 96k, 64-bit recording, a lot of that does to have as much to do with things," he states. "People really can't tell the difference, even the guys that are mixing these things, but their ears and experience give them the taste to know what sounds good. Ultimately that is what is important. It's not about how old you are or anything, it all comes down to how you listen to music, and whether it sounds pleasing or not." So, turning this around to a consumer audiophile perspective: Based on Beato's commentary, does the audiophile community make too much of a fuss over the digital file debate? Does the audiophile community's pursuit of high-end gear cause them to lose sight of the possible truth that they lack the training and experience to properly differentiate audio file quality? It isn’t hard to understand why those of us who sell “expensive” equipment (hopefully at a profit) aren’t inclined to argue with customers who honestly believe they can hear a difference in CD quality (44.1 KHz) audio and DVD Audio (192 Khz) or SACD formats. How would that benefit us? Even though a double blind study published by the prestigious Audio Engineering Society (yes, the AES of AES/EBU) proved we humans (of any age) can not detect any difference in those “delivery formats”. That’s right, the study concluded a CD 44.1 KHz delivery format will reproduce sound as well as a 192 KHz or SACD delivery format in their double blind study. But if you read the details of the study methodology you may also conclude you need a DVD-A or SACD player since you can’t buy the same quality audio recording on a CD. If you could it would be equivalent. Isn’t that a shame. The methodology used in the double blind study took the highest quality DVD-A and SCAD recordings and down converted the delivery format to 44.1 KHz to eliminate any difference in the audio sources being compared. Their tests proved no differences could be detected in the audio reproduced from the 44.1 KHz or 192 Khz delivery formats. But they also concluded the lack of understanding in the audio recording industry caused the original DVD-A and SACD recordings to be produced with much more care and held to a much higher quality standard “because” they “assumed” that delivery format would expose flaws that would go undetected by any CD listener. They were wrong. The study proved that if the industry took similar care producing and mixing the audio intended for CD delivery it would be equal in quality to the sound produced from DVD-A and SACD delivery formats. But the fact remains the industry DID NOT (and still does not in most cases) so if you want that extreme high quality audio you can’t buy it on a CD delivery format. If you could I’d have to agree it would be equivalent but the fact remains you can’t. This study does, however, underline the absolute “technical” stupidity of the HDMI audio format of 8 channels of uncompressed 24 bit 192 KHz audio when 16 bit 44.1 KHz would have been equal but as a marketing ploy not so stupid. It turns out if a customer has a preconceived idea (even if incorrect) of what he wants the path of least resistance is to give him what he wants as long as it doen’t compromise anything other than his wallet. It costs a LOT more to change his mind and attempting it may even stop a sale dead in its tracks! You can see that throughout practically every product we sell in this industry. 4K and ESPECIALLY 8K video is even more of a waste than 192KHz audio! You don’t need a double blind study to prove that no human can detect a difference in those formats and 1080 resolution at 8 feet on a 60” screen (it can be easily proved mathematically by taking the arctangent of the eye’s angular maximum resolution proving 2 lines of 4K and 4 lines of 8K will fall within the same spot on our retinas as one line of 1080). But they certainly look better at 2 feet! And that is what the customer sees when he is buying them. How would it benefit a reseller to get his customer to back off to a reasonable viewing distance like 7 or 8 feet and show him his old 1080 TV is just as good? But 8K is REALLY absurd as it requires 64 Gbs transmission and that demand imposes serious compromises elsewhere in the system (not just cost) so I do hope customers will finally come to their senses and stop allowing the marketing people to continue overriding good engineering judgement. 8K will look even better than 4K (at 2 feet!) and if consumers accept it hook line and sinker (even though zero benefit for them at normal viewing distances) they won’t even realize the compromises 64 Gbs imposes. My perspective on the Audiophile Debate was realigned a few years ago when I had the pleasure of having Industry Legend and former Tenor, Joseph Grado demonstrate Audio Dynamic Range by singing part of an Opera in my Charlotte, NC Audio/Video store while standing in front of a system valued at over $100k. It was incredible and it became immediately clear that no amount of money could reproduce that sound electronically but I digress. For those past, present, and future customers who express a desire for something extraordinary in exchange for what they’re willing to invest, my job is to not resist and provide any means practical and possible for those individuals to achieve what they’re looking for and to provide them the best possible service and support afterwards. Perhaps the only limitation is my own decision to apply perception of objectivity when I believe the customer’s subjective has gone awry. I may never know how many sales I’ve lost by stepping in too soon. Those who spend a career in this industry scoffing at those who are passionate about their quest for better sound should take the time to consider whether or not they’re doing all of us a dis-service simply because they’re reached the limits of their own ability to enjoy what it is we do. I used to work for a Linn HiFi dealer. We had tunes playing all the time. One day I had to go to the Bose store and get something for a customer. When I walked into the Bose store, it felt like someone was beating my ears with a hammer. On another occasion Linn was doing a demonstration at the store for a customer who was interested in buying one of their $20,000 CD players. Linn made a $1200 CD player, a $6500 CD player and the $20,000 CD player. Now grant you, the sound was being pushed through their best preamp, 4 $20,000 amplifiers , and 2 $30,000 speakers. 3 identical CD’s were played. and the difference in sound quality was pretty amazing. As the price went up, so did the quality of the sound. As I get older, the Fletcher Munson curve becomes more apparent every year, but just because I, and my clients, can’t hear the top and bottom ends as well as before, a better quality, non compressed music source is much more enjoyable than compressed music. Going beyond CD quality music gets to a point of diminishing returns quite quickly, as the ears of a 64 year old can’t quite pick up on the nuances of that much better music. While some audiophiles might take it to the extreme , there is no question you can tell the difference between compressed and High res. High res music allows you to feel the emotion, whether it’s from better detail, enhanced sound stage or imaging, there is just no comparison. I am not saying it’s important enough to some people to pay for it, but to pretend that you can’t tell the difference is just nonsense. You don’t need a trained ear to hear the significant difference between Pandora and Tidal, just listen, and not on those $10.00 headphones. A fairly outrageous claim. Ignore. And regarding his scientific process, a one person trial is certainly meaningless from a statistical standpoint. And in this case, the one person is absolutely irrelevant because it is a known phenomenon that trained musicians are the worst when it comes to hearing audio playback differences. Their musically-trained brain fills in the missing information from their base of musical knowledge. They are truly the least discriminating when it comes to evaluating high-performance audio equipment. I have found that REALLY high end stereo systems properly set up or “tuned” can help differentiate between compressed and lossless formats. Transparency is the key word. Electrostatics come to mind as a good example of transparent loudspeakers, although many other speaker designs can be highly transparent as well. Properly set up electrostatic speakers are an “in your face” room decor problem for 99% of our customer base, so it is difficult to promote for an ideal listening experience. I would suggest that a quiet room with properly set up Electrostatics(or comparable dynamic designs) would allow for a higher percentage of accurate answers to whether what a person is listening to is CD quality or compressed. Super high end headphones would also allow for improved accuracy IMHO.